Sanctify us, we beseech Thee, O Lord, with Thy holy blessing, and grant us, by the intercession of St. Michael, that wisdom which teaches us to lay up treasures in Heaven by exchanging the goods of this world for those of eternity, Thou Who lives' and reigns, world without end. Amen. By the intercession of St Michael and the celestial Choir of Seraphim, may the Lord make us worthy to burn with the fire of perfect charity. Amen. By the intercession of St Michael and the celestial Choir of Cherubim, may the Lord vouchsafe to grant us grace to leave the ways of wickedness, to run in the paths of Christian perfection. Amen. By the intercession of St Michael and the celestial Choir of Thrones, may the Lord infuse into our hearts a true and sincere spirit of humility. Amen. By the intercession of St Michael and the celestial Choir of Dominions, may the Lord give us grace to govern our senses and subdue our unruly passions. Amen. By the intercession of St Michael and the celestial Choir of Powers, may the Lord vouchsafe to protect our souls against the snares and temptations of the Devil. Amen. By the intercession of St Michael and the celestial Choir of Virtues, may the Lord deliver us from evil and suffer us not to fall into temptation. Amen. By the intercession of St Michael and the Celestial Choir of Principalities, may God fill our souls with a true spirit of obedience. Amen. By the intercession of St Michael and the celestial Choir of Archangels, may the Lord give us perseverance in faith and in all good works, in order that we gain the glory of Paradise. Amen. By the intercession of St Michael and the celestial Choir of Angels, may the Lord grant us to be protected by them in this mortal life and conducted hereafter to eternal glory. Amen. O glorious prince, St Michael, chief and commander of the heavenly hosts, guardian of souls, vanquisher of rebel spirits, servant in the house of the Divine King, and our admirable conductor, who shines with excellence and superhuman virtue, vouchsafe to deliver us from evil, who turn to you with confidence, and enable us by your gracious protection to serve God more and more faithfully every day. Amen. 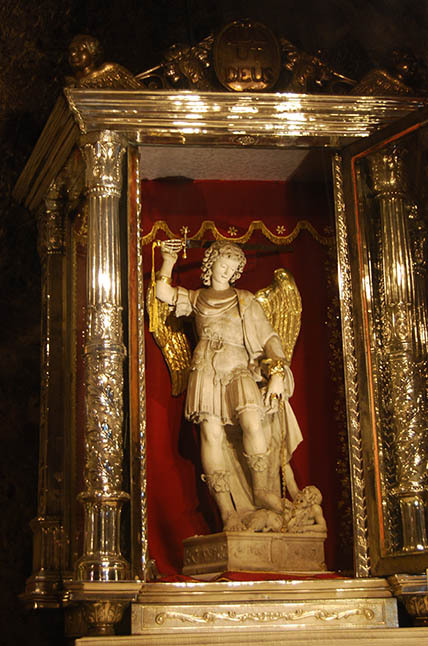 The feast of St Michael the Archangel is on 29th September. May we prepare for that event with nine-day novena to the Prince of Heavenly Hosts. Do not hesitate: ask him for blessings for you and your family. Most glorious Archangel, St Michael, who full of faith, humility, gratitude and love, far from adhering to the suggestions of the rebellious Lucifer or of being intimidated by the sight of his numerous followers, rose at once against him, and animating the remainder of the heavenly court to defend the cause of God, gained a complete victory over him. Obtain for me, I beg of you, the grace to discover all the snares, and resist all the attacks of these angels of darkness, so that triumphing after your example over them, I may merit to shine one day on that seat of glory from which they were precipitated never to rise again. Saint Michael the Archangel, defend us in battle, etc. Most glorious archangel, St Michael, who, appointed by God the guardian of all the Hebrew people as his instrument, consoled them in their afflictions, enlightened them in their doubts, provided for all their wants, even so far as to divide the seas, to rain down manna from the clouds, and to draw water from the rocks, I implore of you to enlighten, console, defend, and assist my soul in all its necessities, that overcoming all the obstacles which are met at every step in the perilous desert of this world, I may arrive safely in that kingdom of peace and delight, of which the land promised to Abraham was but a shadow. Most glorious archangel, St Michael, who, constituted the head and defender of the Catholic Church, rendered her always triumphant over the blindness of the Gentiles by the preaching of the Apostles; the cruelty of tyrants, by the firmness of her martyrs; the malice of heretics, by the wisdom of her doctors; the evil customs of the world, by the purity of her virgins, the sanctity of her Pontificate and the penitence of her confessors; defend her continually from the assaults of her enemies, deliver her from the scandal of her unworthy sons, so that showing herself always peaceful and glorious, we shall continue to hold most firmly our belief in her dogmas, and persevere until death in the observance of her precepts. Most glorious archangel, St Michael, who stands beside our altars to bear to the throne of the Eternal Majesty our prayers and our sacrifices, assist me, I implore of you, in all the exercises of Christian piety, that I may perform them with constancy, recollection, and faith, so that they may merit to be presented by your hands to the Most High, and to be accepted by him as incense of grateful sweetness. Most glorious archangel, St Michael, at whose feet the most sublime dignity of this earth bows down in humiliation, look with an eye of mercy on my miserable soul overruled by so many passions, stained by so many sins, and obtain for me grace to overcome the former and detest the latter, that having once risen to a new life I may never again fall into so unhappy a state. Most glorious archangel, St Michael, who, being the terror of the devils, is destined by the Divine goodness to defend us from their assaults in the last combat, console me, I implore of you, in that dreadful moment with your sweet presence, help me with your invincible power to overcome all my enemies, that saved through your means from sin and hell, I may praise your power and mercy for all eternity. Most glorious archangel, St Michael, who with more than paternal eagerness descends compassionately into the suffering Kingdom of Purgatory to free the souls of the elect, and transport them with you into eternal happiness, obtain for me that by leading a holy and fervent life I may merit to be exempt from those fearful pains; but if for unknown faults or not having made sufficient atonement in this life I shall be condemned to suffer there for some time, plead then my cause before our Lord, and inspire all my friends to offer suffrages for me, that as soon as possible I may fly to heaven to shine with that most holy light which was promised to Abraham and all his descendants. Most glorious archangel, St Michael, who art destined to sound the trumpet announcing the General Judgment, and to precede the Son of Man with His Cross in the great valley, obtain that the Lord may anticipate it for me by a judgment of goodness and mercy in this life, chastising me beforehand for my sins, that my body may rise with the just to a blessed and glorious immortality, and my spirit be consoled at the sight of the Lord Jesus, who shall form the joy and consolation of all the elect. Most glorious archangel, St Michael, who, constituted the governor of all mankind, are in a special manner the guardian of the Catholic Church and of her visible head, bring back into the bosom of this elect Spouse of Jesus Christ all the wandering sheep, non-believers, Jews, schismatics and sinners, that all, united in one common sheepfold, may together sing for all eternity the sovereign mercy. Preserve the Church in the way of sanctity, and defend from all enemies the infallible interpreter of her will, her vicar on earth, the Roman Pontiff, that always, obedient to the voice of that universal pastor, none may stray from the path of salvation, but all, increasing every day in justice, both subjects and superiors, peoples and leaders, may form on earth that society of peaceful and indissoluble concord which is the image, the prelude, and the pledge of that perfect and eternal society which all the blessed in heaven compose with Jesus Christ. there awaiting you and me. I’ll give you strength to follow me”. your dear Knight I wish to be. let me give my heart to thee. in his arms you’ll find his peace. his protection is our bliss. shall be heard without a miss. call on him, oh! call on him. how can we forget our fear? who awaits so very near. call on me, oh call on me”. of great St Michael here today. to join forces and to pray. if we save so many souls. give me strength to follow thee.